Monday’s Raw main event featuring Sasha Banks and Bayley was exactly what the Survivor Series season is all about. A pure all-out brawl that ended with one side standing tall as the other side retreats. Alexa Bliss announced her red brand participants in the main event segment, Monday. She came to the ring with Mickie James, Nia Jax, and Tamina in tow and announced the three women would be on her team, as well as Natalya, who she “sent home” for the rest of the night due to the Riott Squad’s attack, earlier in the night. Bliss announced a match for the main event to determine the final member of the team, a match where two best friends leave it all on the line for their chance at a spot; Sasha Banks vs. Bayley. The match was extremely nostalgic of their NXT days, enjoyable to fans, and a breath of fresh air, as it has been a bad year for both Sasha Banks and Bayley, as far as creative is concerned. They spent the first half of the year alluding several times about the friendship dissolving, highly teased by locker room and backstage fights. The superstars had one match against each other on Apr. 16 on Raw that ended in no-contest. All of this anger between two best friends only led them to a therapy session where they had to “work it out” with the legendary Dr. Shelby. Since seeking counseling, the best friends have reunited in full form, and have been referred to as the “Boss ‘N Hug Connection”. For the second half of this year, they’ve squared off against the Riott Squad, and continue to be kept away from the title picture. The results from last night’s invasion from the SmackDown roster could be a turning point for both Banks and Bayley’s careers, if correctly sought out. Neither Banks nor Bayley won their match last night, as Tamina interfered and the match ended in no-contest. Bliss announced that Ruby Riott would take the final spot for Team Red, instead. After the attack putting the SmackDown brand and their leader, SmackDown Women’s Champion Becky Lynch, over as the top of the WWE, Banks and Bayley were nowhere to be found. This duo could very well jump ship to SmackDown and change not only their current status on the roster, but also the dynamic of the title picture. This change could also get all four of the WWE Horsewomen on one roster. With the match ending in no-contest, and neither of them being on the Survivor Series match card this Sunday, they could very well turn their backs on Raw at the event. This betrayal could help the blue brand take the first victory since the brand extension in 2016. Banks and Bayley jumping ship could also solidify that a WWE Four Horsewomen versus the MMA Four Horsewomen match could be looming. Ronda Rousey is at the top of the chain on the Raw, and it’s only a matter of time before her friend Shayna Bazsler, the NXT Women’s Champion, takes her spot on the main roster. The other two MMA Four Horsewomen, Jessamyn Duke and Marina Shafir, made their presence known at the Evolution pay-per-view just a few weeks ago, assisting in Baszler’s victory against Kairi Sane. The only catalyst of having a feud between both factions at the moment, would be the unlikely sisterhood of Charlotte Flair and Becky Lynch. 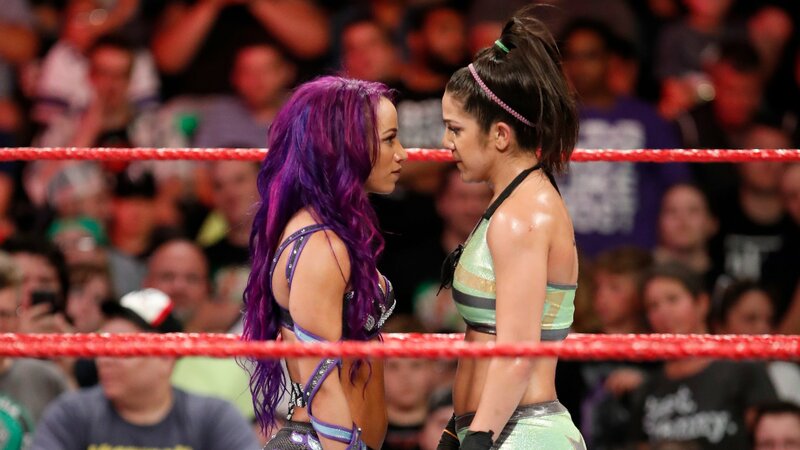 Even with the most recent bump in Sasha and Bayley’s friendship, WrestleMania could arguably be the earliest this feud may work. Should Sasha Banks and Bayley jump ship to the SmackDown roster and help them win Survivor Series? When is the earliest that a Four Horsewomen feud could believably take place? Could this be a perfect opportunity for both women to be used more efficiently?